A valid Norton subscription ensures that your security is always up to date. You must activate or renew your subscription before the trial or subscription period ends to continue to use all of the Norton features and keep your computer protected. If you got your Norton subscription from the Norton Online Store or the service provider, activation takes place automatically when you download and install Norton by signing in to your account. However, if the activation failed due to an error or you skipped it during the installation, use the information below to complete the activation or renewal of your subscription. You can also use this information if you purchased your Norton subscription from other means, downloaded a trialware, or got the subscription from your service provider. Your computer must be connected to the Internet to complete the activation or renewal process. You can also use Norton Automatic Renewal service for uninterrupted protection. 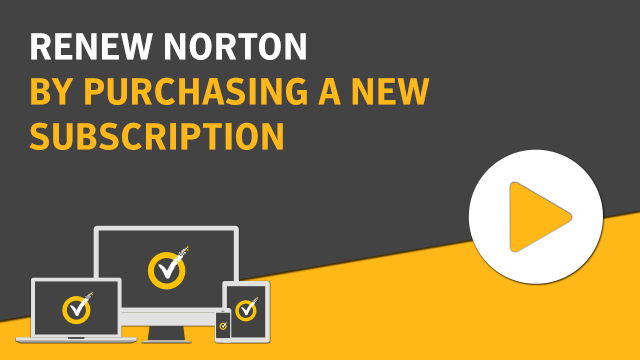 If you do an upgrade purchase while renewal or activation, you need to download and install the purchased Norton product on each device you want to protect, depending on the number of devices your license allows. You can do this immediately after your purchase or by signing into your Norton account. In the Norton main window, click Renew or Activate Now. If you see the Subscription window, click Buy a subscription. On the Norton products or renewal page, review your purchase, and then click Buy Now or Subscribe Now. If prompted, sign in with your account credentials. Enter your billing information and place your order. Ensure that you review your order before making the payment. On successful purchase, your subscription gets activated or renewed automatically. Any days remaining on your existing subscription will be added to the new subscription period. For example, if you have 30 remaining days and you go for a one-year renewal, you get 395 days of protection with the product. Renewal code may not be applicable with some Norton products. To activate your subscription, in the Norton product main window, click Activate Now. To renew your subscription, in the Norton product main window, click Help and then under ACCOUNT INFORMATION, click Enter Product Key. Enter the product key or renewal code that you received from Norton. If you are not sure about the product to which the key that you have is associated with, please follow the instructions in I want to download my Norton product on my device. If your product key does not work, see Why is my product key not working? If you use a product key, the remaining days with your current subscription do not get added to the subscription associated with the new key. If you use a renewal code, your remaining subscription days are added to the new subscription period. Your license is automatically stored in your Norton account if you buy your subscription from the Norton Online Store or if you have already activated your product. You can also follow these steps if you did not download and install the product after your purchase from the Norton Online Store. In the Norton product main window, click Activate Now. You can also click Activate Now from the activation alert. If you get a sign-in prompt, provide your Norton account credentials. Choose the Norton Security license and then click Next. If prompted, enter the product key that you received from Norton. If you have used up your licenses, you can transfer a license from an unused device to another at ease. For more information, see transferring your license to a new device. In the Norton product main window, in the Help drop-down menu, click Enter a PIN. In the Activation Needed alert, select Activate Now, and then click OK. If prompted to sign in, provide your service provider login credentials. On the Subscription window, enter the PIN that you received from your service provider and then click Next. Type in a name for your computer, and then click Activate. Click Finish to complete your activation. In the Norton product main window, click View Options. In the Subscription Canceled alert, click Show me my options from the drop-down list, and then click OK.
Click Help me stay protected (Recommended) to purchase the subscription. Click Contact my service provider to resolve the issue by contacting your service provider. Click Reactivate the subscription - I've resolved the issue to activate the product if you have already purchased a subscription. What to do if I have used all the licenses in my subscription?